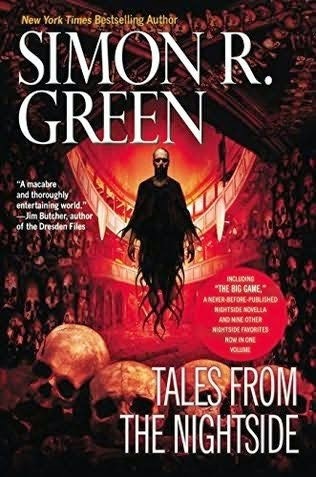 This collection reprints all of Simon R. Green's short stories set in the milieu of his Nightside series, which is firmly in the CU. Naturally, several of these stories have crossovers of their own. For instance, in "The Difference a Day Makes," John Taylor sees a lipstick-red Plymouth Fury with a dead man grinning at the wheel (the titular car from Stephen King's novel Christine) and a great black beauty of a car, driven by an Oriental in black leathers, and a man in the back in a green face mask and a snap-brimmed hat (the Green Hornet and Kato; per CU continuity, this is probably the most recent duo to use those names, Paul Reid and Kono Kato), among other references in that story. "Some of These Cons Go Way Back" refers to taduki (from H. Rider Haggard's Allan Quatermain tales), tanna leaves (from Universal's original Mummy film series), Martian red weed (from H.G. Wells' The War of the Worlds), Hyde formula (from Robert Louis Stevenson's novel, of course), and black centipede meat (from William S. Burroughs' novel Naked Lunch.) There is also a new novella pitting Taylor against Sir Francis Varney from James Malcolm Rymer's Varney the Vampire. I need to pick this up. I've read at least some of the stories in various collections. I know I want to read the new novella. I assume it includes "Hungry Hearts" which was an interesting pastiche of the Maltese Falcon. I've never read any William S. Burroughs' novels, but I remember Philip Jose Farmer referencing his books and comparing them Lester Dent and Edgar Rice Burroughs. Only Farmer would do that (and he makes some very good points.) Of course, Farmer wrote a Tarzan story in the style of William S. Burroughs. Yes, "Hungry Hearts" is included.